better than i could have imagined: weekend. This weekend, Geoff went to the deer lease with my dad….so the kids and I had some good ole quality time together. He left Friday morning, and we finished up a little school shortly after. We had lunch and then headed to a nearby park. The weather the past few days has just been beautiful. Parker was able to ride her bike as I pushed Grace and Nolan in the stroller (Grace also has a bike, but would much rather sit in the stroller and be pushed. Sometimes I make her, but other times, it's just not worth the argument. :) Then eventually made our way to the little playground. So big riding her bike without training wheels (this happened a couple of weeks ago, but I'm, of course, behind on posting it here). 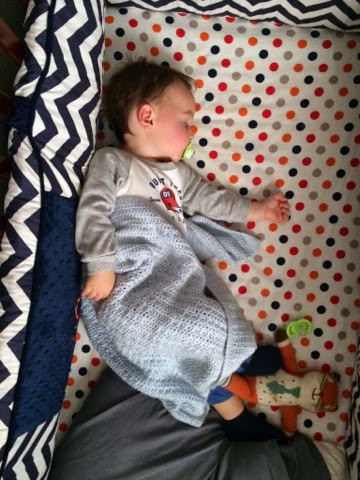 We came home and put Nolan down for a nap. The girls watched a show and then ended up outside on the trampoline. And with a little static! For the past few days we've had the windows open all day long, and when the kids are playing outside, the back door is open, as well. We have all been loving this weather. 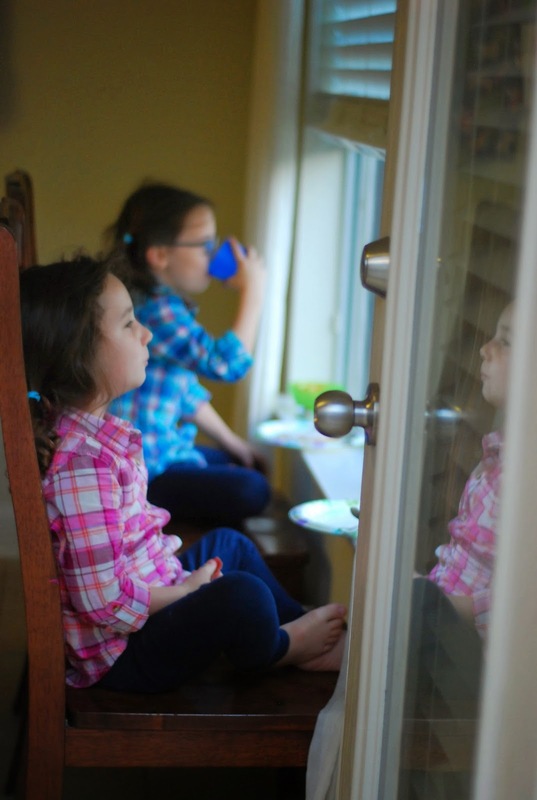 One night, the girls turned their chairs around to eat dinner with an outside view. Ha! Saturday morning was slow. And good. The girls wanted to draw and color…so I pulled out a piece of paper for Nolan. He thought he was so cool. This picture makes me so happy. 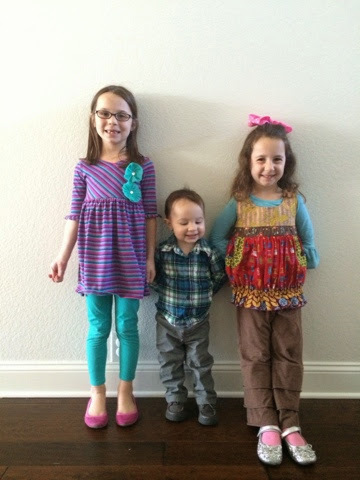 Sometimes I just still can't believe we have 3. And they are healthy and we are so very blessed. After lunch we played in the back yard for a bit, then headed to the school playground up the street for a little extra playtime (I'm trying to wear these kids out for an easy bedtime, y'all!). Then a quick trip to Sonic for Happy Hour. And back home for nap/quiet time. Then dinner, baths, and movie night! For some extra fun, I blew up our queen air mattress, and brought out the popcorn popper. We popped away. And seasoned and salted to our hearts' desires. And it was so good! They also got to pick 3 pieces of candy out of their Halloween candy. We watched the My Little Pony Rainbow Rocks movie and called it a night. They were all in bed a little later than planned, but it was a nice ending to a really good 'ordinary' day. Sunday morning…we ran about 15 minutes late to church. No matter how early I get, up it's hard getting out the door on time. This morning, I will say it wasn't my fault, but someone had to go the bathroom. But I still got the picture!! After church, we picked up lunch. Nolan went down for his nap shortly after and slept for over 3 hours!! This bub was so tired. I was making all kinds of noises, opening blinds, taking pictures. He didn't move. The girls watched a movie (while I snuck in about an hour nap…with a couple of interruptions, no less, for important things like... if they could have candy or a snack….yes…less than one hour after we had eaten lunch!!!) But I did feel a little more rested. The girls played outside for the rest of the afternoon and I spent most of my time in the kitchen and picking up a bit before Geoff returned. We're glad he was able to get away for the weekend for some hunting and 'guy time'….but we sure are glad he's back! Looks like you did wear that poor little guy out! So loved the pictures of them turning their chairs around to look outside. Ole Aunt "B" is missing that weather already and we've only made it to our third day of cold!